Originally I’m from Germany, but I now live and work in South Portugal, though I continue to work and offer workshops in Germany and other countries. For 3 years I studied and trained intensively in the Instructor Program at The Monty Roberts International Learning Center in California, where I worked directly with Monty Roberts and his instructors. During my training, the head instructor and my main teacher was Koelle Simpson. In 2009 I was introduced to “The Work”, I learned how to combine this, with horse work, when I visited Koelle in Arizona. 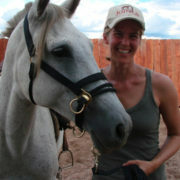 I concluded training to become certified as a Coach for The Work and as an Equus coach by Koelle. Our farm provides a peaceful setting for individual coaching sessions and workshops. The horses are carefully chosen, safe and kept naturally outside in a herd.